A pet should never be given on impulse or as a surprise. Pets require a commitment of time, energy and financial resources for their entire life. Those interested in owning a pet should carefully consider their decision and choose a pet who fits their lifestyle when the time is right. Pets are not toys and can't be placed on a shelf once the novelty of the gift wears out. Children lack the skills and responsibility for a long-term commitment to a pet, and those tasks often fall to an adult caretaker. Teach children that bringing a pet into the home is a family decision that requires research and commitment. In addition to the time required to get a new pet situated to the family, the costs are estimated to be $1,000 to $2,000 in the first year, and that’s provided the new puppy or kitten doesn't get into any trouble that might require emergency care. 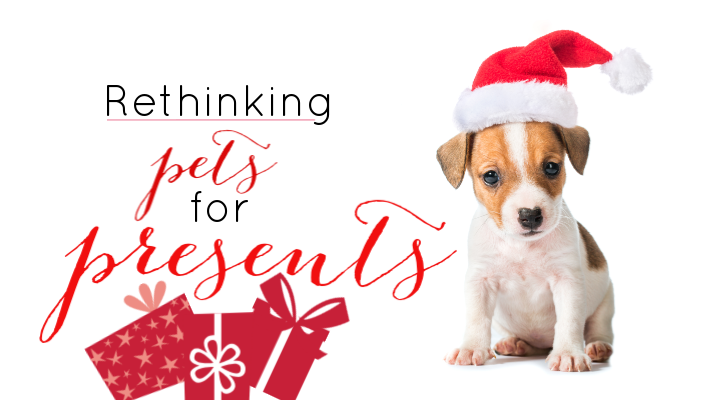 Unscrupulous puppy mills and pet stores will take advantage of the emotional draw of the holidays to market puppies and kittens for sale as pets. But taking a new pet home during the busy holiday season is stressful on both the pet and the new family and is a recipe for disaster. The holiday season and all of its trimmings present extra dangers to a pet. Bringing a new pet home requires extra time and attention on training and establishing routines, which the extra bustle of the holidays doesn’t often lend itself to providing. If you're thinking about getting a pet, save the adoption for after Christmas and choose books and gifts that will help inform the decision instead. If you are certain the recipient is interested in getting a pet, consider paying for the pet's adoption fees ahead of time and allowing the gift receiver to choose the pet who best suits them after the holidays when the hustle and bustle has settled down and they can truly enjoy getting to know one another and create a life-long bond. When you are ready to bring a pet into your home, we’ll be excited to meet him or her at Critter Care Animal Clinic! Call us at 920-458-3636 to make your first visit and get started off on a journey of pet wellness! Happy Holidays!